Imagine we redefine public education so that Dewey’s democratic society is co-created ongoingly, bettering each moment we practice it. 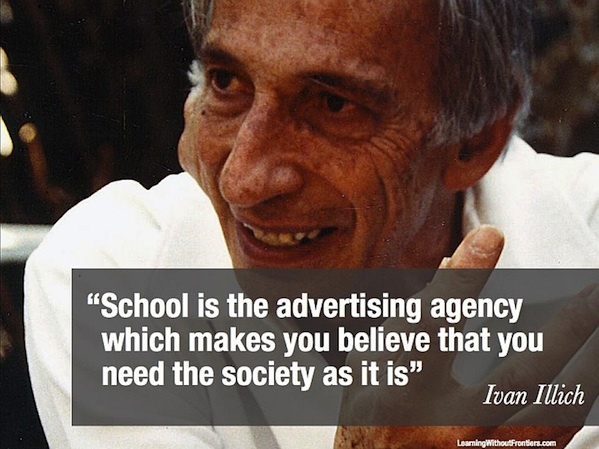 Imagine public education becomes the vehicle to social change, rather than, as Illich notes, a potential addiction to dependency. Imagine someone like Schmidt meets up with someone like Thiel and they agree on a premise that people are good, that human capital is our gold, that we really can learn/be/do anything today, and that the more we facilitate that for everyone, rather than regulate/manage some given/standard ideal, this debate becomes an ongoing conversation — a crowdsourcing — about what matters most. Not only do we then address Dewey and Illich, but GB Shaw as well. So imagine we do change the law, we redefine public education, how do we play that out? We’re suggesting we focus on five elements in any community/city. Perhaps a means to scaling the individual, rather than waiting for incredible innovations to scale. Are spaces being utilized in the best ways possible? We really do have all we need, today, if we share. Lisa Gansky’s The Mesh models this mentality of sharing. 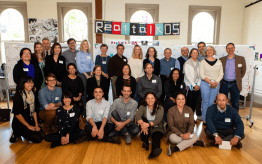 Not only are spaces shared, but they are always morphing as perpetual beta as the city/community crowdsources gatherings that matter via ongoing conversations  and tech enhanced match ups . Is everyone known by at least some one? That is our safety net, a declaration of interdependence. Each person is free as long as they are connected, like the buddy system. 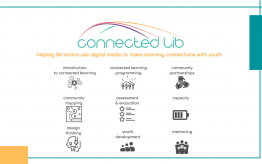 Like Sugata Mitra’s grandmother model – where it’s more about the connection than anything, more about knowing the person enough to provide/strew fitting resources. Beyond that, connections/mentors are gathered per choice of each individual. Choice empowers, and so people choose/create their own network. This network, these connections, become the alluring web of the intent of their heart, their gold. We no longer spend time & money [public ed #2 market in the US], to prep youth for jobs that may or may not exist, or for credentialing that may or may not matter. Instead, we prep for uncertainty within the safety net of interdependency. Are mentors free to deliberately not teach? Are they free to do this same self-directed learning, following their fancy, deep practicing? Are they modeling useful ignorance, being vulnerable in context, so others can see what to do when they don’t know what to do, what to do in the face of uncertainty? And as they are freely swimming in this space of permission themselves, are they listening deeply in order to facilitate the curiosity within each person they are coming to know? Are people coming together to listen without an agenda? Are they seeking the common good of their city/community? Are they modeling an intention economy? Are they letting tech help us find each other, listen to each other’s hearts, to each other’s stories. We are currently working on crafting an app as a means to facilitate the chaos if we set a bunch of people free to play in a city, and a collaboratory space for weekly community conversations. If there is no fixed standard of educational success, do learning disabilities exist?